The Olympic flame came to Geneva on the 24th of June 2004 as a part of its voyage to Athens. This reportage begins with the flame at the panathenean stadium in Athens. 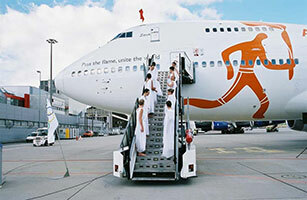 Then we go to Geneva airport with the Greek priestesses to meet the plane bringing the torch. Then we travel throughout Geneva with the torch bearers and finally arriving at the United Nations. An olive tree was offered by the Greek community in Geneva to the municipality . The final torch bearer was the Swiss tennis man Marc Rosset (Gold medallist in Barcelona 1992). Nana Mouskouri was also there.